Information: This American fanzine was devoted to Japanese animation. The above volume was dedicated mainly to 'Gatchaman' and 'Battle of the Planets'. 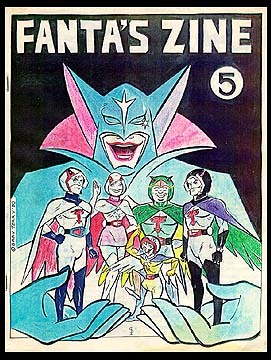 It contained information on the following subjects; An overview of Gatchaman and Gatchaman II, A Battle of the Planets episode synopsis from Sandy Frank's Working drafts (53 episodes only), An episode title guide to Gatchaman and Battle of the Planets, A translation of a French article on Battle of the Planets, A write up on Gatchaman's adversaries, A bibliography on the first 7 issues of the Battle of the Planets comic book series, Some secrets of Gatchaman (translations of Gatchaman articles from Animage, Vols. 2 and 10) and a number of Gatchaman and Battle of the Planets related color photocopies. There were 125 copies of this magazine produced.